Well, in this post, I will be discussing the usefulness of each error metric depending on the objective and the problem we are trying to solve. When someone tells you that “USA is the best country”, the first question that you should ask is on what basis is this statement being made. Are we judging each country on the basis of their economic status, or their health facilities etc.? Similarly each machine learning model is trying to solve a problem with a different objective using a different dataset and hence, it is important to understand the context before choosing a metric. Most of the blogs have focussed on classification metrics like precision, recall, AUC etc. For a change, I wanted to explore all kinds of metrics including those used in regression as well. MAE and RMSE are the two most popular metrics for continuous variables. Let’s start with the more popular one. Here, we are trying to find “m” and “b” and we are provided with data (x,y). The above equations are simpler to solve and the same won’t apply for MAE. Edit: One important distinction between MAE & RMSE that I forgot to mention earlier is that minimizing the squared error over a set of numbers results in finding its mean, and minimizing the absolute error results in finding its median. This is the reason why MAE is robust to outliers whereas RMSE is not. This answer explains this concept in detail. The numerator is MSE ( average of the squares of the residuals) and the denominator is the variance in Y values. Higher the MSE, smaller the R_squared and poorer is the model. Why should you choose Adjusted R² over R²? There are some problems with normal R² which are solved by Adjusted R². 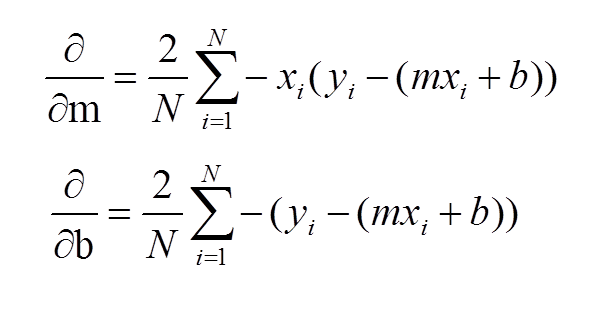 An adjusted R² will consider the marginal improvement added by an additional term in your model. So it will increase if you add the useful terms and it will decrease if you add less useful predictors. However, R² increases with increasing terms even though the model is not actually improving. It will be easier to understand this with an example. So if we fit simple ordinary least squares (OLS) model for each case, logically we are not providing any extra or useful information to case 2 and case 3 with respect to case 1. So our metric value should not improve for these models. However, it is actually not true for R² which gives a higher value for model 2 and 3. But your adjusted R² takes care of this problem and it is actually decreasing for both cases 2 & 3. Let’s give some numbers to these variables (x,y) and look at the results obtained in Python. For the previous example, we will see that RMSE is same for case 1 and case 2 similar to R². This is the case where Adjusted R² does a better job than RMSE whose scope is limited to comparing predicted values with actual values. Also, the absolute value of RMSE does not actually tell how bad a model is. It can only be used to compare across two models whereas Adjusted R² easily does that. For example, if a model has adjusted R² equal to 0.05 then it is definitely poor. Common Misconception: I have often seen on the web that the range of R² lies between 0 and 1 which is not actually true. The maximum value of R² is 1 but minimum can be negative infinity. Consider the case where model is predicting highly negative value for all the observations even though y_actual is positive. In this case, R² will be less than 0. This will be a highly unlikely scenario but the possibility still exists. Let’s compare the above two translations with BLEU score. Brevity Penalty penalizes candidates shorter than their reference translations. For example, if the candidate for the above mentioned reference is “ The cat”, then it will have a high precision for unigram and bigram because, both the words are present in the reference in the same order. However, the length is too short and does not actually reflect the meaning of reference. Hopefully, most of the useful measures in regression are covered in this blog. Please comment if anything is missed, will really appreciate ideas for the next blog. 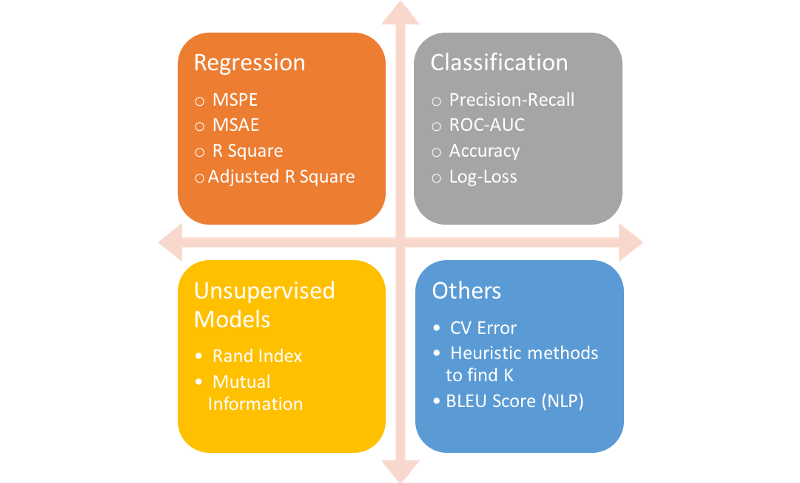 I will discuss the important metrics of classification and unsupervised learning in the next blog. Stay tuned! In the meantime, check out my other blogs here!